Preparing for the rigorous Q-Certification exam? Or simply interested in learning more about the role of organic acids and their impact in coffee quality? Then we highly suggest get a hold of our "Organic Acids Taste Kit". Developed by coffee scientist Joseph A. Rivera and co-developer of the Q-Certification program, this kit will provide with four (4) of the most common organic acids found in specialty coffee. The protocol which has now become part of the Q-Certification exam, was based on years of research in understanding the role of acids in coffee quality. We are the official developers of both the Organic Acids modules as well as the Coffee Quality Institute's - Q-Certification program since its launch in 2000. Over the years we've provided various training materials for students and instructors to successfully carry out the over 22 exams required by the Q exam. The Q-Grader consists of over 20 exams. Of these a critical piece is the ability to identify and differentiate the four most commonly found acids (ie. citric, malic, phosphoric, acetic) in coffee. For more information on the Student vs Instructor Kits click below. The kit includes everything you need to re-create the samples tasted during an actual Q-exam and/or SCAA Cuppers Tasters Certificate (CTC). Acids play an important role in coffee's taste profile and can vary significantly depending on the level of roast. This kit will allow you to experiment with coffee acids to explore the nuances of each acid and its impact on taste. Don't have a degree in chemistry? No worries, we'll provide you with all the technical information on each acid, its importance both before and after roasting. This kit is used for students who are preparing to take the Q-Exam or who simply want to experiment on the affect of organic acids on taste. Please note that this set is NOT meant to run courses, refer to the FAQ section for more information. 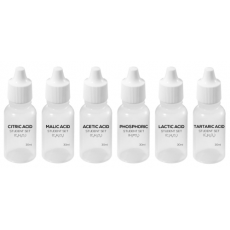 The kit is composed of an Instruction Manual and four 30mL bottles of the following acids. ** is not found in coffee, but is included for experimental purposes. In addition, all acids are made of food grade purity and in compliance with the Coffee Quality Institute's Q-Certification standards. What's the difference between the Student and the Instructor Kit? Both kits are essentially the same. The only difference is that the Student kit is meant more for experimenting/practicing on a per cup/per individual basis, while the Instructor kit is meant for conducting a Q-course or running a larger training course. For more information on the Student vs Instructor Kit, click here. These kits are ready to use, no dilution is necessary. All instructions on using each kit are included in the order. Have these kits been used for SCA/CQI courses? We are the original developers of the Organic Acids course, as well as the Q-Certification program, as such we've been the primary suppliers of these acids for SCAA/CQI courses for many years. Can these acids be used for SCA/CQI Lab Certification? But you will need the Instructor Kit for this NOT the Student Kit. What is the average shelf life of these kits? The kit should be good for up to one year from the date of purchase. Where did the name 'Organic Acid Kit' come from? Originally when Joseph Rivera (former SCAA Director of Science & Technology) developed the course around 2000 the class only focused on 3 organic acids commonly found in coffee, namely citric, malic and quinic. As more research was conducted on acids, the class was expanded to include phosphoric acid which is inorganic. When we launched the class during the SCAA Expo (2001) it was listed as official program as "Organic Acids Profiling". The course has since gained tremendous popularity and the name has stuck since. Yes, do we do ship internationally. The most economical shipping method is USPS Flat Rate which will typically arrive within 9-11 days of shipment, the second fastest is Priority International which takes about 7-9 days. If you need fast delivery, we recommend DHL International, please contact us BEFORE you place your order for a quote since it is not linked to our system. Please provide complete shipping address to generate a accurate quote.